This post gives you the idea for assembling the Amarino shield. To get full details about this shield, CLICK HERE. When you buy the kit package, you will get the following PCB. The PCB clearly shows the pin and component names, so, it should help you to get idea of connections of components to Arduino. 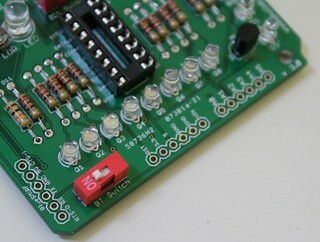 For example, LDR is connected to A1 and RGB LED is connected is to D3, D5 and D6 and you can see those pins labeled on the PCB. – Start with 220 Ohm resistors. Solder all the 220 Ohm resistors. Depending upon the types of LEDs, the value of resistors may vary. The LEDs that come with the shield package work perfectly with 220 Ohm. It should also work with 100 Ohm and 330 Ohm resistors. – Solder all the 3mm white LEDs (Q1- Q8). – Solder the 2pcs of 3mm LED (Qs and Qs’). Fix the light dependent resistor (LDR) also. – Solder LM35 temperature sensor. Check out the experiment with LM35. – Solder 5mm white LED. This LED is there for sensor graph Amarino experiment. – Solder RGB LED. This RGB LED is used for multicolor lamp Amarino experiment. – Solder 16 pin DIL socket. – Stack the CD4094 chip over the DIL socket. – Solder the 4 pin and 6 pin female headers for Bluetooth modules. The Amarino shield supports 3 different Bluetooth adapters, check out here. 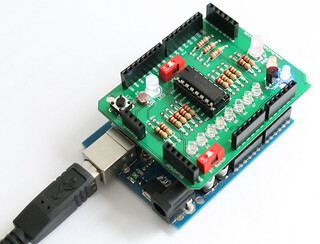 – Finally, solder the stackable header and your shield is ready to use.